As a rule, the bathroom is an intimate place where we have time in order to be with ourselves. For this reason, it is an area that requires maximum privacy, since we need to feel comfortable and, despite all the inherent exposure, limit exposure to anyone else. This is especially important when it comes to the shower area. The first option that comes to mind is the traditional shower curtain. A more advanced, yet equally obvious prospect is glazed sliding doors. Both are excellent choices and can make your bathroom more comfortable and suited to your personal taste, but if you like to try new options, we will offer you some which you may never have seen or which has never even crossed your mind! 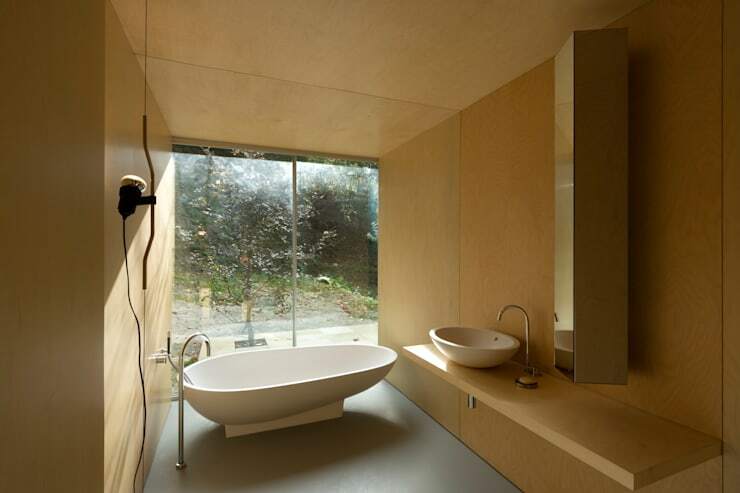 Regardless of the size (either a tub or a simple shower ), this is an area where we enjoy a good soak, which relaxes and includes our whole body in the experience, so it is necessary that we feel comfortable with the space. For this, in today's article we will present seven options for covering the shower area in the most appropriate way for you! Whether you want to make the space more or less relaxed, we are certain that any of these suggestions will refresh your ideas, facilitating the choice for your bathroom. Our first suggestion rests on a classic choice—and therefore it should perfectly suit most free-standing showers and tub-showers in our day-to-day lives. The glass (or plastic) doors ensures that your shower is a space all to yourself (or with whom you want to share, of course), with a clear and discrete division from the rest of the bathroom. One of the great advantages is found in its description: despite unequivocally delineating the outer space of the bathroom from the internal shower space, it adds no weight to the environment nor assumes an aggressive or imposing appearance. The major disadvantage is that it needs cleaning almost daily, if you demand a well-presented space, since any drop of water that falls on these surfaces will be visible after drying. Therefore, to facilitate the maintenance of cleanliness, it might be advisable to pass a clean cloth over the surface after each shower. Clear plastic works just like the glass doors, with the advantage of being cheaper and you could also find options with reliefs—in case you prefer a barrier that does not expose 100% of its contents. Reliefs will help to blur the definition of your silhouette behind the door – perfect for en suite bathrooms with less private barriers to the bedroom. Opting for a curtain will appeal to our more nostalgic side and let our bathroom relive the olden days. Whilst being an ever-present bathroom accessory, the curtain has gone through several stages and has been manufactured in various materials, with plastic and waterproof textiles gaining greater prominence. Nowadays, you can find them in various colours and patterns that range from the most obvious to clearly unthinkable. There is something for everyone, from solid or transparent colours, to true collector's items. 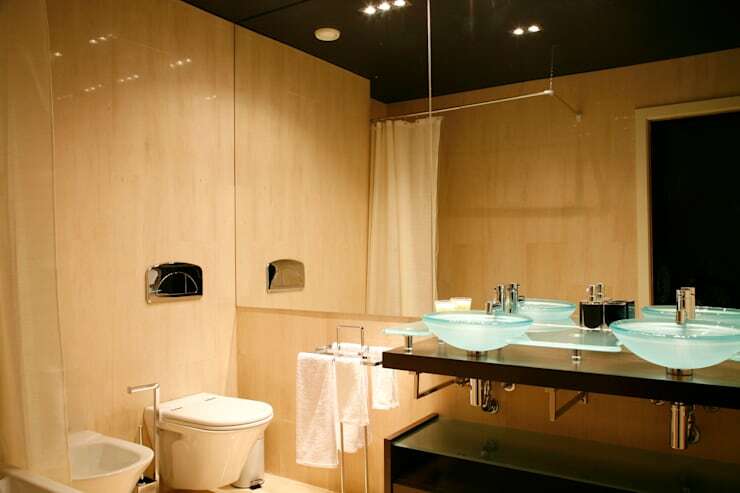 The big advantage is the ease with which it is applied in the bathroom, being able to adjust the height. However, it needs some maintenance when it comes to cleaning, so it does net get mouldy. Avoid keeping it in contact with the water out of bath time and allow to dry well after showers. Do you like the classic and always winning glass door, but want to give it some personality? Then this is the suggestion that we made with you in mind! Nowadays, we worry ourselves with two key issues with regards to the decoration of our homes: the price of the item and what difference it makes. When money is no problem or obstacle to the project of our dreams, we can get exactly the environment we want and that we have imagined for a given area of our house. However, when the budget is less generous, we find ourselves almost forced to buy the same items at the same stores everyone else frequents. Therefore, here is an option to save our wallets without having to skimp on creativity: vinyl applications are great decorators, both in terms of options and price! If you are the type of person who prefers more free time in the shower, this suggestion is the most suitable for you. 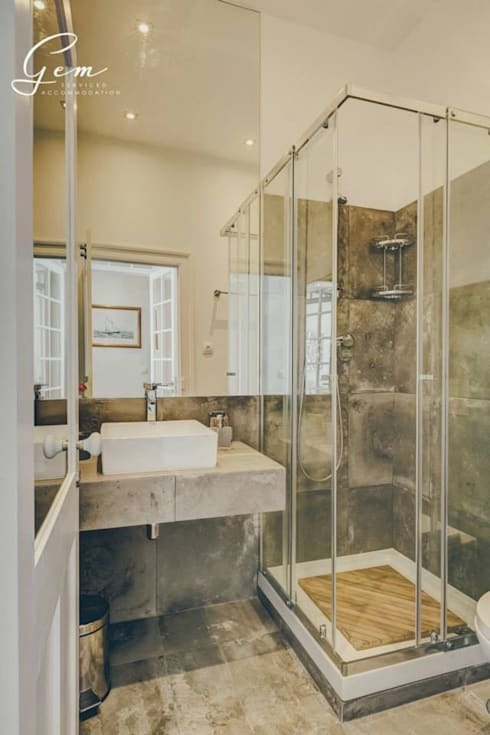 In case you feel completely at ease to have nothing separating the shower area from the rest of the bathroom, half walls are the most suitable for your bathroom. You just have to make sure that the other room materials (including the floor) is not only prepared to get wet, but that water can be drained easily. Before taking on a project of this calibre, see you’re your options are with regards to drains and pipe outlets in the bathroom. When you are left with the finished work, you have several ways to decorate this new part. Mosaics provide a youthful air and, depending on the colour, cheerful style. You can also combine several colours, making patterns or designs with various mosaics. 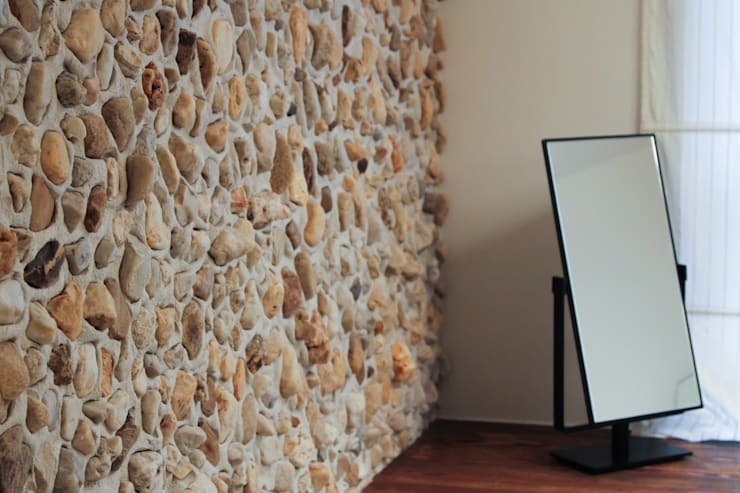 An alternative to the finer mosaics, we also present the option of larger stone application on the dividing wall, which will result in a more rustic and less modern setting. 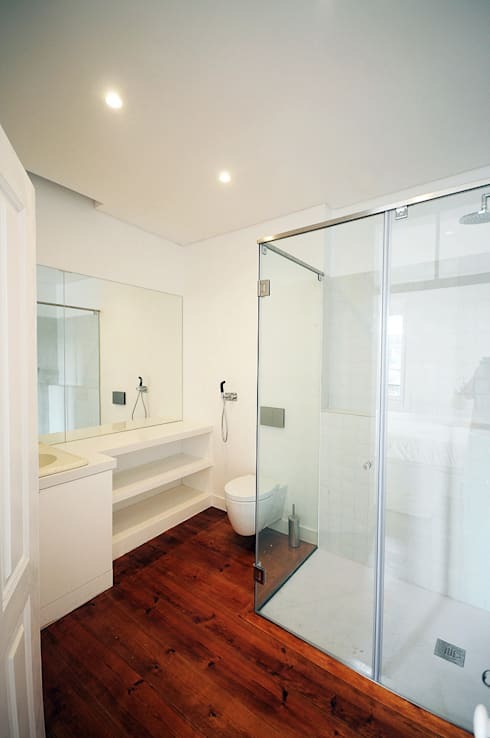 If your bathroom fits in this environment, choose this option to increase the privacy of your shower! A free and natural option: without walls! Finally, we come to the probably less conventional option, but one that gives us more freedom and sensuality: a shower area without any barriers, such as in the beautifully modern example shown above, by Correia/Ragazzi Architects. Allow yourself to feel free in the moment of relaxation. Regardless of having a bathtub-shower or a shower only, this option has had a large following, in particular highlighting suite bathrooms. 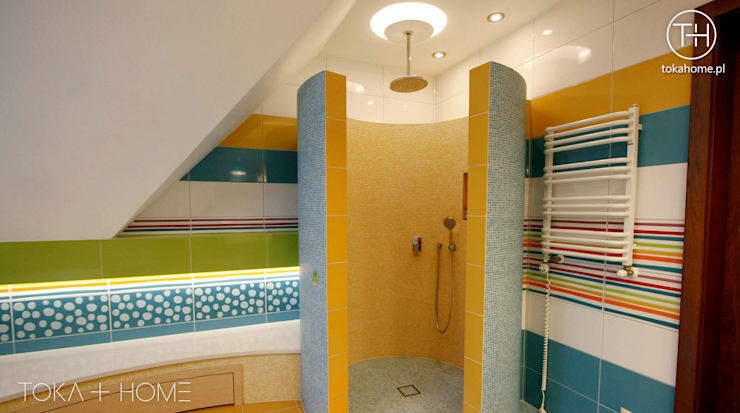 For more inspiration, take a look at these: Shower Designs Worth Singing About. Which idea did you find most refreshing? Is there one you'd like to have in your bathroom? Let us know!